OUCH! That’s the sound coming from Anthony Brown’s campaign headquarters after hearing of a $405 million drop in expected state revenue over the next 21 months. This is bad news for the lieutenant governor’s gubernatorial drive. The shrinking revenue forecast not only buoys Republican Larry Hogan’s campaign, it powerfully reinforces Hogan’s central theme: Maryland’s budget is out of kilter and in need of serious overhaul. Hogan received an unexpected boost last week from Democratic Comptroller Peter Franchot’s sharp critique of the state’s liberal Democratic spending policies. At Wednesday’s Board of Revenue Estimates meeting, Franchot took to task the “What, me worry?” attitude being taken these days by Gov. Martin O’Malley and Brown when it comes to Maryland’s continuing revenue shortfalls. 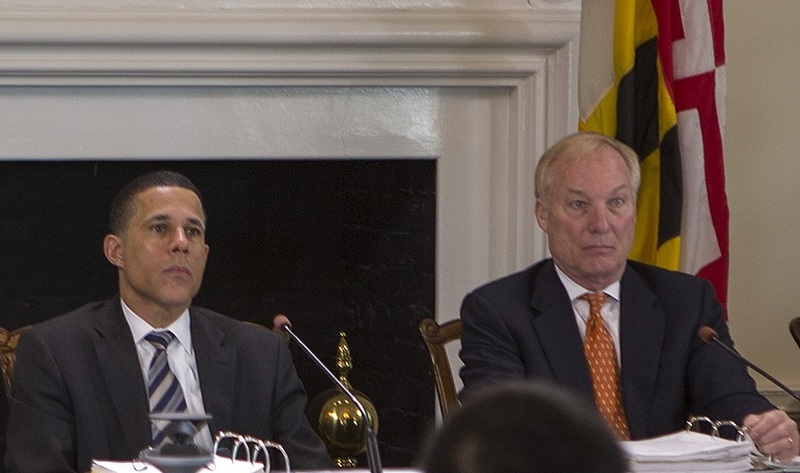 Indeed, Franchot’s comments could be grist for future Hogan ads. That’s a damning criticism aimed squarely at the governor and lieutenant governor. “Maryland’s 6.4 percent unemployment rate is higher than the national rate of 6.1 percent – something we’ve only experienced twice in the past three and a half decades. . . . In terms of wages – the oxygen working families need to survive – Maryland’s average wage growth was just 0.4 percent in the first quarter of 2014. . . This is exactly what Hogan has been saying. That is an ominous indicator which the O’Malley-Brown team is blissfully ignoring. Why? Because it is politically unpalatable. Yet no one is rushing to close this new revenue gap in the state’s budget calculations and tighten up on state spending. Brown doesn’t want to announce unpopular cutbacks during an election campaign; O’Malley would rather delay nasty decisions until he leaves office. Brown is ignoring the reality that Maryland could face difficult budget years ahead that won’t allow for the raft of social programs he’s promising voters. That’s what Larry Hogan has been preaching on the campaign trail, albeit in vague, superficial terms. It is folly to assume, as Brown does, that there will be hundreds of millions, if not billions, of dollars available for his expensive campaign proposals. That list starts with a statewide pre-kindergarten program and tax breaks for veterans. Neither may be affordable in the current economy. But are voters listening? Do they understand that what Brown is promising them isn’t deliverable under the present sluggish economy Maryland confronts? Do they understand that Maryland could face difficult times unless it reins in its borrowing and its overspending? The public’s grasp of American economics isn’t very deep. Numbers tends to make people’s eyes glaze over. That’s what Brown is counting on. Meanwhile, the Scarlett O’Hara approach to managing Maryland’s chronic structural deficit continues. Wishing that tomorrow will bring us blue skies and strong economic growth isn’t enough. Franchot is right. Hope is not a viable economic strategy.